You’ve been thinking about buying a KitchenAid but you’re just not sure. Here we will take a look at what really makes a KitchenAid a kitchen aid. Firstly KitchenAid Stand Mixers are made from cast zinc with a baked enamel coating – this is good for two reasons: firstly, the solid metal construction means that your KitchenAid won’t move across the work surface, and the enamel coating is extremely unlikely to chip because it is baked on. The KitchenAid has a 300w motor, giving enough power to knead 1kg of bread dough. The motor is at the top of the mixer, rather than in the base, meaning that no power is lost while the mixer is in use. One of the features which set KitchenAid apart from other stand mixers is that it was the first mixer to use planetary action for mixing. This means that while the attachment turns one way, the mixer head turns in the opposite direction to allow for maximum mixing. It’s a bit like if you’ve ever been on a waltzer at a fairground and you are spun one way, while the ride moves in the opposite direction – without the sickness! The KitchenAid Stand Mixer can just as easily whisk one egg as it can 10, as the bowl and each attachment have been made to fit together perfectly. You will notice that while the wire whisk is made from stainless steel, the dough hook and cake mixers are stainless steel and nylon coated. Although the KitchenAid Stand Mixer might seem a bit intimidating at first it is actually incredibly simple to use. There are 6 different speed settings which work on a ratchet so you don’t accidentally knock the speed while in use. There is no on or off button, just moving the speed from 0 will start the mixer. When changing the attachment there is a lock to keep the mixer head in place – all you have to do is make sure you have the right attachment on when you use it! Some of the most popular attachments (purchased separately) include the Pasta sheet roller and cutter set which allows you to make sheets of pasta, or cut spaghetti or tagliatelle. Once your pasta has been made, you can hang it on the KitchenAid Pasta Drying Stand which has a handy wand allowing you to easily move the pasta from mixer to stand. If you do a lot of cooking or baking, you may wish to purchase an extra bowl, such as the Glass Bowl 4.8L pictured above. The great thing about this is that it comes with a silicone lid, which is handy for when you need to store anything in the fridge. It has a pouring spout for ease of use, and metric and imperial measurements on the side of the bowl. It is also freezer, microwave and dishwasher safe making it incredibly versatile. One little extra KitchenAid offer is a free cookbook when you send your guarantee off to them. It is a hardback cookbook with loads of recipes in for every occasion, and a great added touch from KitchenAid. Still not sure? KitchenAid Stand Mixers come in 26 different colours, from classics such as Almond Cream to the brighter Candy Apple, Cranberry or simple Onyx Black. 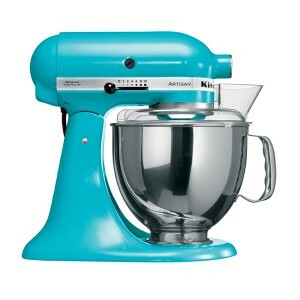 baking, cakes, KitchenAid, KitchenAid stand mixer, stand mixer. Bookmark.